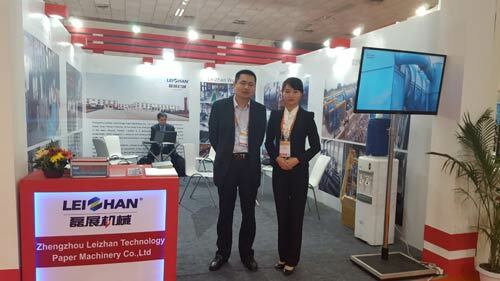 Zhengzhou Leizhan attended the India Paperex 2015 international exhibition in Pragmatic Maiden Pavilion, New Delhi, and made a great success. The India Paperex 2015 has 13 pavilions and attracted more than 21893 visitors from 69 countries. India’s paper and paperboard production capacity, accounts for only 2.5% of the world’s total output. Relevant departments predicted that in the next five years, India’s paper and cardboard consumption will increase from the current 12 million tons to 17 million tons. Even so, India’s per capita consumption of paper and cardboard is only 14 kg, far lower than the 57 kg of global average per capita consumption level, the India market has huge potential. According to China paper making industry situation, in response to “Silk road economic belt”economical strategy of Xi General Secretary of CPC Central Committee, to further promote Chinese manufacturing enterprises “go out”, our company strengthens the cooperation with foreign company, and made a great success in foreign trade. Leizhan exported whole set waste paper pulp making line and individual equipments like Drum Pulper, M.C. Pressure Screen and so on for Malaysia, Iran, Uzbekistan, Vietnam, Egypt, South Africa, Zambia, Bangladesh and other countries. In the first half of 2015, Leizhan has got Vietnam Fujiang Paper Industry 200t/d whole set of packaging paper pulping equipment contract , Egypt two 150t/d whole set of packaging paper pulping lines contract and Iran Pardis Kaghaz Paper Industry 500t/d T-paper, Kraft liner board pulping equipments contract.